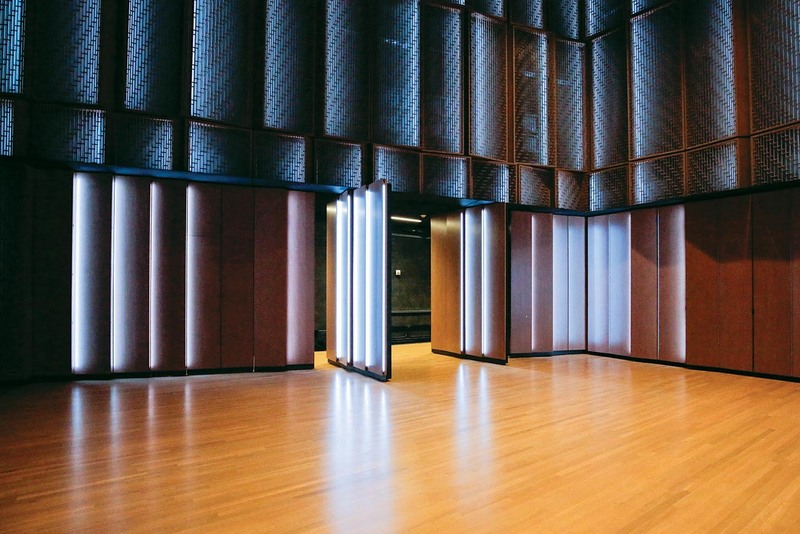 Located in Southern Minnesota’s Northfield community, the state-of-the-art Kracum Performance Hall is the centerpiece of Carleton’s brand-new Music and Performance Commons at the Weitz Center for Creativity. Carleton College purchased the vacant schoolhouse that would become the Weitz Center for Creativity in 2005. From the earliest stages of the project, the plans for this historic building a few blocks from campus called for preserving its history and unique architectural features. At the same time, architects would create a new, innovative space that would make it far more than an arts building. Over the years, the 1910 schoolhouse’s exterior on Union Street remained largely unchanged. But, on the inside, the facility was entirely reimagined to include a cinema, performance theater, classrooms, and gathering spaces for meetings, lectures, temporary exhibits, and small performances. 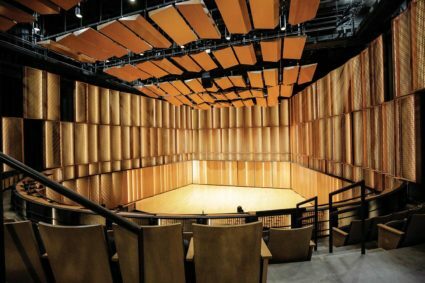 Working closely with McGough Construction, HGA Architects, Acoustical and A/V designers Acoustic Distinctions, and theater consultants and lighting designers Schuler Shook, Carleton was ready to start Phase Two of this ambitious project in 2016. This time, they were building the new Music and Performance Commons from the ground up. Once complete, the $35 million investment would become the home for the majority of Carleton’s music program while also creating a modern performance space to replace the existing Concert Hall. When the project was completed in 2017, the Kracum Performance Hall became the crown jewel of the Weitz Center for Creativity. The Schuler Shook team was eager to tackle the design challenges for the newest addition named for benefactors and Class of 1976 Carleton alumni, Rich and Laurie Weiss Kracum. In the end, the 400-seat Kracum Performance Hall utilizes customizable, state-of-the-art acoustics and soundproofing, a stage that could accommodate a choir and orchestra simultaneously, and support a broad range of curricular, co-curricular, and performance needs. When the college broke ground, the project partners were confident the plans for the Kracum Performance Hall would amplify Carleton’s long-standing tradition as a leader in interdisciplinary arts. To achieve a technically advanced performance hall that could accommodate a wide range of events and presentations with minimal effort to modify the space, the project team worked with Wenger Corporation to select products that were not only optimal in acoustical quality, they offered long-term value, stunning visuals, and easy set up to accommodate all types of performances. From custom motorized pivoting Wenger Diva® ceiling panels, custom rotating walls, rolling acoustic towers, motorized acoustic curtains, J.R. Clancy automated hoists that raise and lower electrics, the Kracum Performance Hall’s flexibility is due to its design innovations. All of this equipment was provided and installed by Wenger | JR Clancy. The motorized acoustical ceiling reflectors and acoustical curtains that wrap the space enable music directors to adjust the acoustics of the room for each performance with the touch of a button. 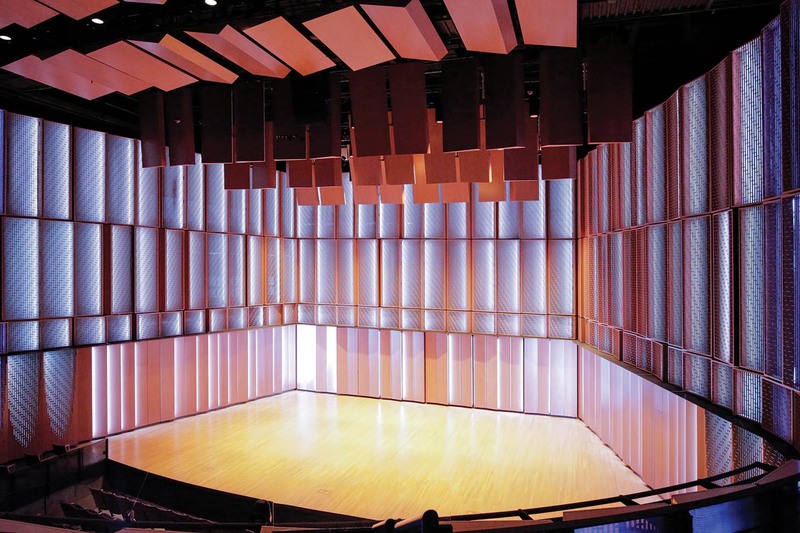 To conceal the sidewall adjustable acoustic curtains, perforated wooden panels are backed by metal mesh so that audience members never see the acoustic curtains, and the visible surface remains acoustically transparent. The metal mesh is illuminated with concealed linear color changing LED strips that completely transform the entire space. The rolling acoustic towers can be rolled downstage to acoustically support smaller ensembles. “I really believe that some of the best craftsmen and the smartest designers were involved in this project,” Zimmerman said. In addition to state-of-the-art acoustics, the project team also included a 29-unit music library and instrument storage cabinets by Wenger that were installed in the Music and Performance Commons. The Kracum Performance Hall has been turning heads since opening its doors in 2017. Whether it’s the community, performers, or prospective students and their parents, visitors immediately recognize Carleton’s commitment to the arts and providing their students, faculty, and audience with the best experience possible. As Carleton College moves into its second season with the Kracum Performance Hall, they’re anticipating a busy schedule of events. 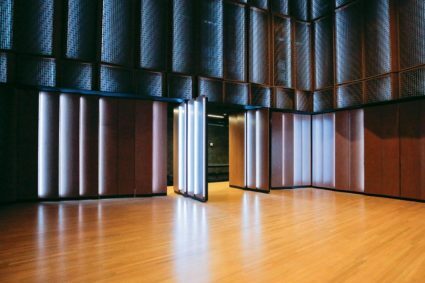 Not only do they have thriving music, performance arts, and dance programs — including a non-Western Chinese ensemble getting worldwide attention — they also encourage students to reserve the hall, and it can function as a professional recording space. In addition to their own performances, the Kracum also hosts outside performers, like the nationally recognized Saint Paul Chamber Orchestra and Sona Jobarteh, the first female Kora virtuoso to come from a prestigious West African Griot family. “I think the Kracum Performance Hall is going to positively impact the school for decades because it’s such an obvious commitment on behalf of the school to the arts,” Zimmerman said. All of the performances held in the Kracum Performance Hall are free to the public. To explore the Kracum Performance Hall in VR, visit http://performance.wengercorp.com/virtual-reality-tours/.